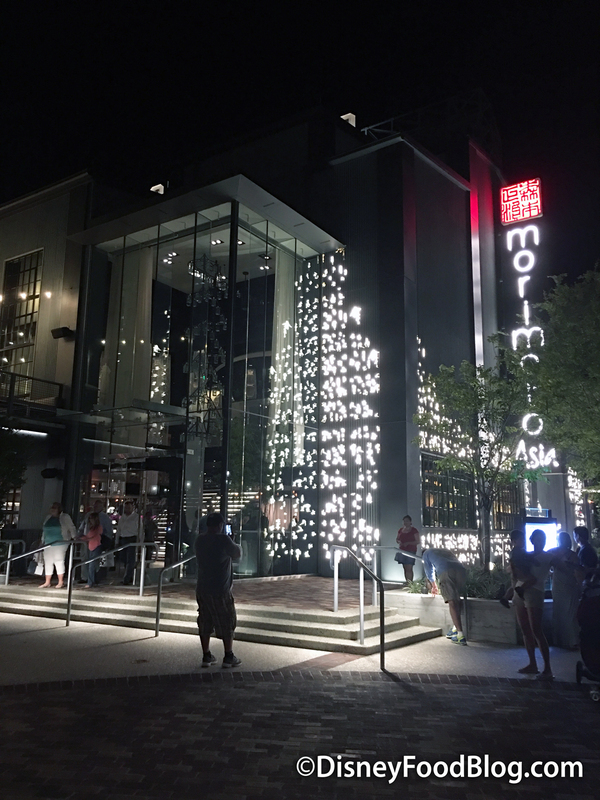 Morimoto Asia arrived in Disney Springs in late September of 2015. Even though this Signature Restaurant is still a relatively new spot, at this point it could be considered one of the more established restaurants in the area given the many additions to dining options in Disney Springs since that time. But Morimoto Asia has still gone through several changes of its own since opening. For instance, Morimoto Asia Street Food has since hit the scene, offering the restaurant’s signature Pan-Asian cuisine in a Quick Service fashion. Even more recently, they’ve created an option custom-made for all you night owls out there enjoying the newly revived nightlife of Disney Springs with a new Late Night Menu! And nighttime is an especially good time to visit Morimoto Asia. Because even though it’s a remarkably beautiful restaurant no matter the time of day, it’s especially pretty at night when the script on the outside of the building is brightly illuminated.